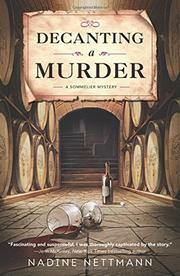 A young wine steward helps a friend facing murder charges. Licking her wounds after failing her Certified Sommelier Exam, Katie Stillwell accepts her friend Tessa Blakely’s invitation to attend a party at Napa Valley’s exclusive Frontier Winery. Unlike other Napa vineyards, Frontier has no showroom or tasting rooms. Instead, it sells directly to selected customers through their wine club, where Tessa works. After introducing Katie to Frontier’s owners, Mark and Vanessa Plueger, Tessa leaves her in the capable hands of handsome vineyard manager Jeff Kingman to go off on an errand. After taking time to enjoy each other’s company and many glasses of Frontier’s fine product, Jeff and Katie find a defunct Mark stuffed in a fermentation tank of pinot noir. Detective John Dean, the cop in charge of the case, promptly arrests Tessa, who has a criminal record for breaking and entering in the course of protecting Katie. Now Katie has to return the favor. Fortunately, Dean is so charmed by the aspiring sommelier that he not only allows her to ride along with him as he investigates, but gives her pretty much unfettered access to Tessa in her jail cell and to other potential suspects in the case. More bodies follow Mark’s until, inevitably, Katie ruffles enough feathers to put herself on the killer’s to-do list. Not all of Katie’s charm and wine savvy can compensate for Nettmann’s complete disregard for police procedure. Here’s hoping that further series entries lavish as much attention on detection as on cabernet sauvignon.